My husband is Italian, which means most Saturday lunches revolve around eating Italian food. It also means that we are quite discerning when it comes to Italian cuisine and we have high expectations. Although we have our favourites in London, we do like to try new places and Zucca in Bermondsey near London Bridge looked like a good choice given its rave reviews. Thank goodness we booked the day before because the restaurant was full and even though our reservation was fairly late (2:15pm), people kept arriving until after 3 (lunch service is from 12 – 3:30). We had requested a table by the window so were pleased when we got one, particularly on such a lovely, sunny day. There is an open kitchen so you can see the chefs at work, which just adds to the lively atmosphere. There are also featured artists, whose work you can see displayed throughout the restaurant. According to their website, the menu at Zucca changes daily and the food is based on a traditional Italian kitchen. We opted for a prosecco and blood orange apéritif and dived into the bread basket while perusing the menu. The bread, all made in-house, was absoultely delicious – the focaccia and parmesan grissini in particular was exceptional. We opted for three starters to share – the burrata with caponata and black olive, the squid bruschetta and zucca fritti (tempura pumpkin and sage). 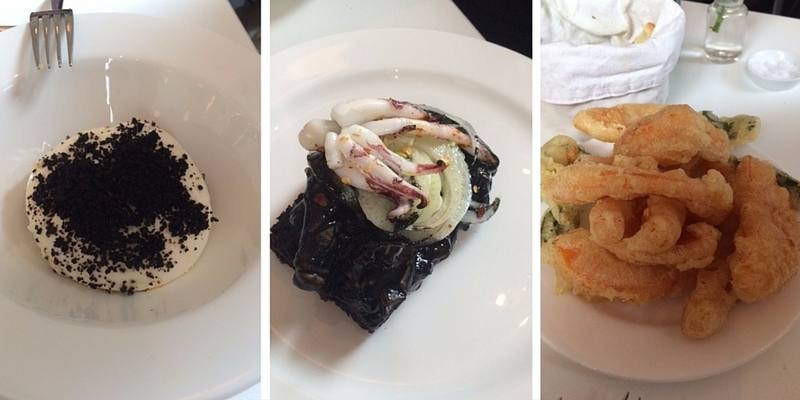 The squid bruschetta was a surprise in that the bread was soaked in squid ink! I was expecting the bread to have a crunch but it was soft, however the crunch from the fennel added texture. The burrata and caponata with black olive was very good, although quite salty, and the zucca fritti was sensational. (L-R) Burrata with caponata, squid bruschetta and zucca fritti. For our mains, we both opted to go for pasta and chose the cordatini with hazlenut pesto and ricotta. The pasta was perfectly al dente and the hazlenuts added a lovely texture. We washed it all down with a beautifully chilled glass of Franciacorta, which is a sparkling wine from Brescia. The food, service and ambience were first class and we will certainly be back to try a new menu at Zucca – perhaps dinner next time. After lunch, we went exploring in Bermondsey and discovered two great markets, full of food stalls, bars and restaurants.